When I was a kid, my grandparents used to say “tie a knot in your handkerchief so you remember.” The thing is, I haven’t carried a handkerchief since I was maybe four years old. 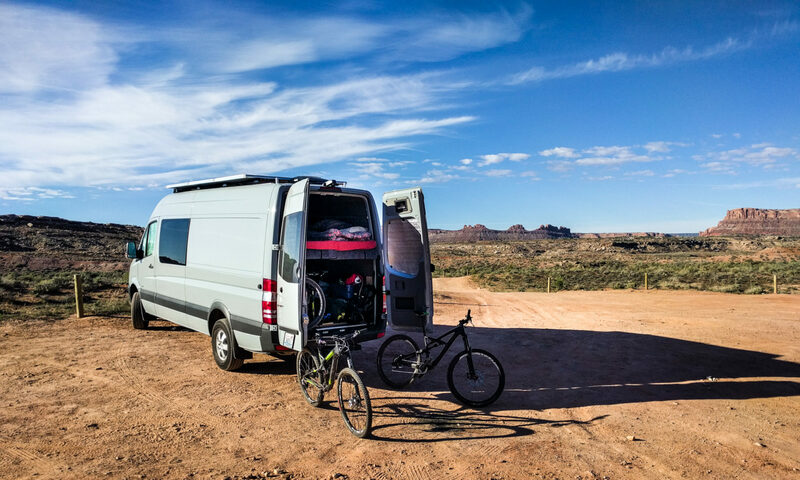 Camping in a van means you’ll have things scattered around outside. You might be plugged in to shore power. You might have your energy-hogging hot water tank turned on. How will you remember to sort everything out before you drive away? Velcro cable ties to the rescue! 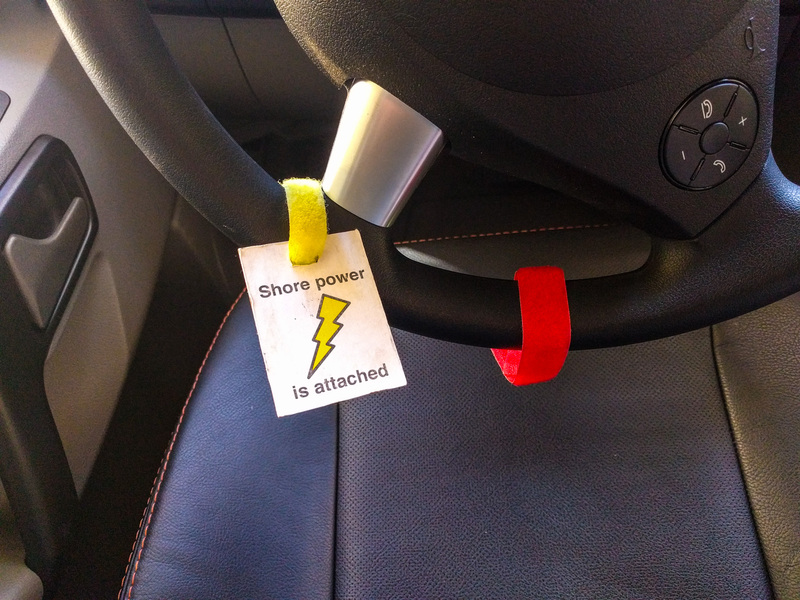 We loop different colored velcro cable ties around our steering wheel to remind us that certain things are attached/detached/plugged in/assembled. That way, it’s obvious what we have to take care of before we can move the van. We have a color code system. The yellow velcro tab is for shore power. This one also has a label on it because it would be very, very bad to drive off with this cable attached. The red velcro tab tells us our hot water tank heater is turned on. The grey velcro tab tells us our poop bucket is stored outside or underneath the van. The black velcro tab shows us that our solar shower is hanging up somewhere. As you can see, this system is extendable and only limited by your imagination and how bad your memory is. When they aren’t being used, the velcro tabs live on or next to the items they’re a reminder for. The yellow tab is stored by the shore power breaker. The red one is by the hot water tank switch. The grey one lives on the poop bucket handle. And so on. That way, we have more of a reminder to put the tabs on the steering wheel when we use each thing. Even if you have a good memory, you might find that you have to move the van in a hurry or when you are distracted by other things. Having the tabs is a great reminder for anyone. Tip of the hat to Dave Orton on the Sprinter forum, from whom we learned this trick.